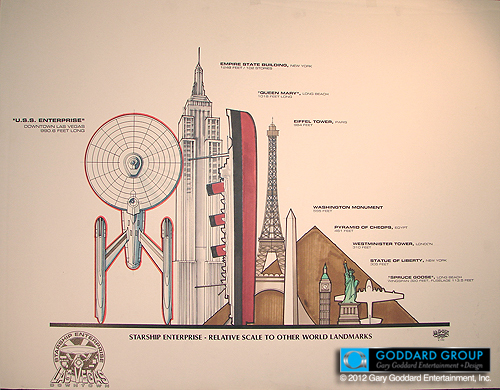 Gary Goddard tells the story of the near-construction of a life-sized Starship Enterprise replica in downtown Las Vegas. Goddard successfully bid to build the attraction as part of the 1992 competition to revitalized Vegas's sagging downtown and bring back tourist traffic that had been sucked away by the strip, but the project was scuttled at the last minute when Stanley Jaffe, then CEO of Paramount, got cold feet. The Enterprise was scrapped and replaced by the "Fremont Street Experience," which stands there today. The “big idea” was building the ship itself at full-scale. That was the main attraction. That being said, we also knew we would have to have some kind of “show” on board. So, conceptually, it was to be a “tour” of the ship, with all of the key rooms, chambers, decks, and corridors that we knew from the movie. There was to be the dining area for the ship’s crew (where you could dine in Star Fleet comfort), and other special features. There were also one or two interesting ride elements that we were considering including a high-speed travelator that would whisk you from deck to deck. But we were really just getting into the show aspects when everything came to a head. Just look at the scale of this thing! NOW IT CAN BE TOLD: THE “STAR TREK” ATTRACTION THAT ALMOST CAME TO LIFE in 1992.